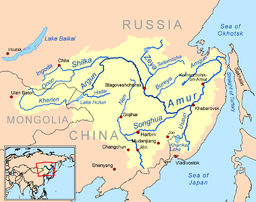 The Amur or Heilong Jiang (Even: Тамур (Tamur), Manchu: , Sahaliyan Ula; Cheenese: 黑龙江; pinyin: Hēilóng Jiāng; Roushie: ре́ка Аму́р, IPA: [ɐˈmur]) is the warld's tent langest river, formin the border atween the Roushie Far East an Northeastren Cheenae (Inner Manchurie). The lairgest fish species in the Amur is the kaluga, attainin a length as great as 5.6 metres. ↑ 1.0 1.1 "Amur River". Encyclopaedia Britannica. Universitat de Valencia. 1995. Archived frae the oreeginal on 2011-04-13. Retrieved 2010-03-19.